ELEANOR - Red hair, wrong clothes. Standing behind him until he turns his head. Lying beside him until he wakes up. Making everyone else seem drabber and flatter and never good enough....Eleanor. PARK - He knows she'll love a song before he plays it for her. He laughs at her jokes before she ever gets to the punch line. There's a place on his chest, just below his throat, that makes her want to keep promises...Park. Set over the course of one school year, this is the story of two star-crossed sixteen-year-olds--smart enough to know that first love almost never lasts, but brave and desperate enough to try. Young adult romance is not the sort of book that I normally read. If I do venture into the young adult genre, it is usually something along the lines of The Hunger Games or such. 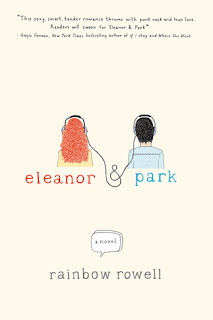 However, I had heard so many wonderful things about Eleanor and Park that I had to give it a try. That being said, I was a little apprehensive because hype doesn't always work out for me. Thankfully (oh so thankfully! ), this was a book that lived up to the hype. There are a lot of things going for this book for me. For one thing, this book is set in my time. As far as I can tell, Eleanor and Park--if they were flesh-and-bone beings--would only be a year older than I am. I'm a sucker of nostalgia and this book brought a lot of that for me. Secondly, Eleanor and Park does romance the right way--the real way. I don't think their relationship is unconventional at all--although I wish that Eleanor's living situation was. This isn't a hallmark card love story. The best I can describe it is that it is a couple steps past a John Hughes movie (again, I think I just dated myself). The dual narrator format can be difficult, both to write and read. In Eleanor and Park, it is what makes the book work. Readers experience the turmoil of emotions inside both of the main characters as they try to figure out their feelings for each other and for themselves. Don't let the "Young Adult" label turn you off this book. It may be about two teenagers, but it is a timeless story. I'm so glad that you gave this one a chance. Wasn't it delightful? Sigh, such a great read! I've never heard of this one, but it looks intriguing. I'll put it on my list. Curiously, in Australia this book has been aimed at the regular adult reading market (format and price of book in particular). Although it is teens that are talking about it...?! I adored this book too. I was curious about all the buzz so I gave it a whirl....it is not my typical read but I was entranced.